It was nearly three decades ago that a young filmmaker wrote, directed and produced a darkly comical short film take on Mary Shelley’s legendary monster. Starring a bull terrier named Sparky, brought back from the dead by a suburban boy named Victor Frankenstein, the 30 minute short was so unusual that it didn’t see an official release for years. Today, that filmmaker is a household name and his gothic charm a quintessential element of more than a dozen full-length features. That’s why Tim Burton fans should be very pleased to know that in 2012, Frankenweenie is getting reanimated in more ways than one. Earlier this year, ShockTillYouDrop.com had the privilege to visit the films elaborate production stages at the London-based 3 Mills Studios and, in the months to come, we’ll be taking you behind the scenes for conversations with the men and women responsible for bringing Sparky (back) to life, including Burton himself. Today, we can share a bit about the expanded storyline and exactly what goes into tackling stop-motion puppetry on such a massive scale. 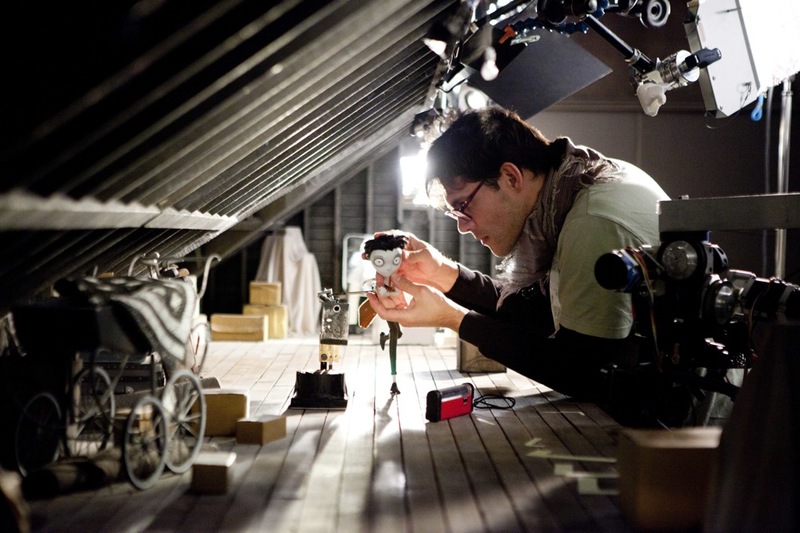 Because of the nature of stop-motion shooting, multiple sets are built as filmed simultaneously, each turning out just a few seconds of footage a day. Many of the sets that were being prepped for production were locations in Victor’s hometown, New Holland. No stranger to stop motion productions, 3 Mills was where Wes Anderson shot The Fantastic Mr. Fox and, further back, where Burton tackled Corpse Bride. 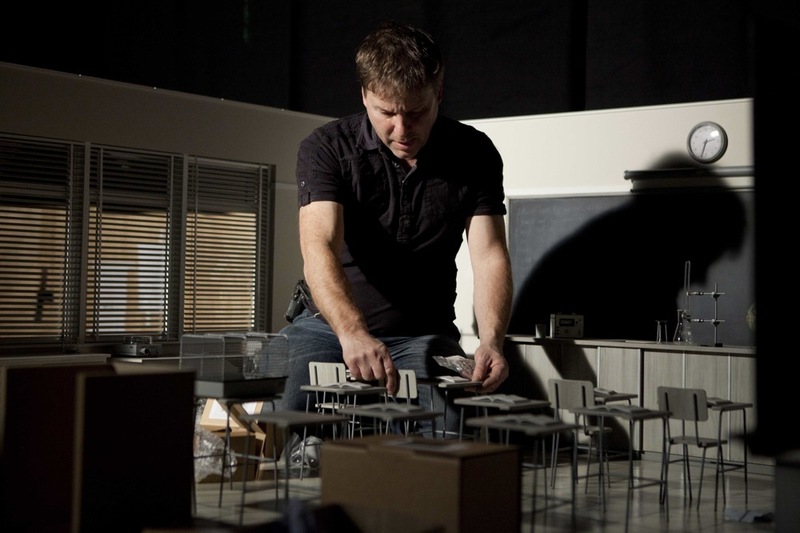 One major difference between Frankenweenie and those productions, however, is the sheer scale of the sets, which have to be enlarged due to the film’s leading canine. The other aspect of the sets that’s instantly striking is that they merge color and black and white. Though the film is being shot for the latter, some elements of puppet-making are simply easier to come by in color and others are designed to make use of the contrast. One of the larger sets still being prepared is the outside of a house along with a roof and a swimming pool. Currently empty, the pool will be added with CGI and temporarily gives puppeteers a solid access point for manipulating the scene. For this particular setup, a second camera is going to be placed to record the mirror image that will be superimposed on the pool’s reflection. Another set is the bedroom of one of Victor’s friends, simply called “Weird Girl.” Her room, too, is a mixture of black and white and color, filled with decidedly girly artifacts. “Tim said that even though the set is black and white, he wanted it to look pink,” laughs Browning. Because the film plays up the suburban setting, Browning points out that the goal is to push generic and boring to such an extreme that it becomes interesting. It’s not hard to see the world of Frankenweenie syncing up with that of Edward Scissorhands and, indeed, the project shows off aspects of much of Burton’s decades of filmmaking, borrowing elements from his entire oeuvre. The voice cast even includes several actors from past films including Winona Ryder (Beetlejuice, Edward Scissorhands), Catherine OHara (Beetlejuice, The Nightmare Before Christmas), Martin Short (Mars Attacks!) and Martin Landau (Ed Wood, Sleepy Hollow). In the work-in-progress footage that was screened for press, many elements of the original short have been translated into Burton’s drawing style, including a “film within a film” that Victor shoots, starring his (still living) Sparky. This time, though, there’s an added gag as young Victor has been shooting his home videos in 3D and asks his parents to put on their glasses to watch. Another scene shows Victor digging up Sparky’s body to begin his experimentation, panning across a pet cemetery where many of the crew have hidden the names of their own real-world pets amongst the gravestones. Theres a lot more come from the world of Frankenweenie, so check back with ShockTillYouDrop.com as we update between now and the films release on October 5, 2012.